A mainly sunny sky. High 66F. Winds NW at 15 to 25 mph..
A mostly clear sky. Low around 45F. Winds WNW at 10 to 20 mph. We've all been hearing about the Red Apple Plaza for some time now, but here is a little secret that's been underreported. The developers are planning an 18-pump gas station on the corner of Tucker and Red Apple/Tehachapi Boulevard. That's right, I was one of the few citizens at the Planning Commission meeting back in December. I voiced my concerns and gave the gas station plan a thumbs-down. I heard discussion between the developers and the commissioners that basically said, for the project to be feasible and profitable this gas station would need to be built. Yes there are several plans including another drug store/pharmacy for that corner, but it just won't be happening. 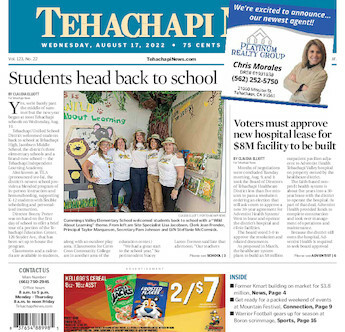 I opposed the gas station because I see that corner as the gateway to Tehachapi. Oh, and we have off the top of my head nine other gas stations, not counting the two truck stops. I think the commissioners have sold us out. Growth has been coming now for awhile. Developers want to come and set up shop here in Tehachapi. I've been around long enough to know that some development is necessary for the economic health of a city. I also know that poor choices such as this gas station can ruin the atmosphere of why people want to call Tehachapi home.